Robust statistics provide reliable estimates of basic statistics for complex distributions. The statistics package includes several robust statistical functions that are commonly used in astronomy. This includes methods for rejecting outliers as well as statistical description of the underlying distributions. In addition to the functions mentioned here, models can be fit with outlier rejection using FittingWithOutlierRemoval(). 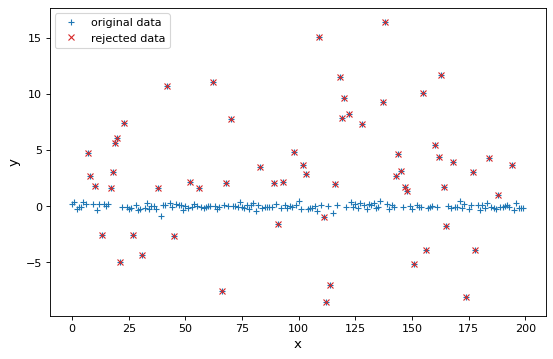 Sigma clipping provides a fast method to identify outliers in a distribution. For a distribution of points, a center and a standard deviation are calculated. Values which are less or more than a specified number of standard deviations from a center value are rejected. The process can be iterated to further reject outliers. The astropy.stats package provides both a functional and object-oriented interface for sigma clipping. The function is called sigma_clip() and the class is called SigmaClip. By default, they both return a masked array where the rejected points are masked. The output masked array then can be used to calculate statistics on the data, fit models to the data, or otherwise explore the data. Note that once the sigclip instance is defined above, it can be applied to other data, using the same, already-defined, sigma-clipping parameters. sigma_clip() and SigmaClip can be combined with other robust statistics to provide improved outlier rejection as well. sigma_clip(data[, sigma, sigma_lower, …]) Perform sigma-clipping on the provided data. sigma_clipped_stats(data[, mask, …]) Calculate sigma-clipped statistics on the provided data. SigmaClip([sigma, sigma_lower, sigma_upper, …]) Class to perform sigma clipping. The median absolute deviation (MAD) is a measure of the spread of a distribution and is defined as median(abs(a - median(a))). The MAD can be calculated using median_absolute_deviation. For a normal distribution, the MAD is related to the standard deviation by a factor of 1.4826, and a convenience function, mad_std, is available to apply the conversion. A function can be supplied to the median_absolute_deviation to specify the median function to be used in the calculation. Depending on the version of numpy and whether the array is masked or contains irregular values, significant performance increases can be had by pre-selecting the median function. If the median function is not specified, median_absolute_deviation will attempt to select the most relevant function according to the input data. This module contains functions for computing robust statistics using Tukey’s biweight function. biweight_location(data[, c, M, axis]) Compute the biweight location. biweight_scale(data[, c, M, axis, …]) Compute the biweight scale. biweight_midvariance(data[, c, M, axis, …]) Compute the biweight midvariance. biweight_midcovariance(data[, c, M, …]) Compute the biweight midcovariance between pairs of multiple variables. biweight_midcorrelation(x, y[, c, M, …]) Compute the biweight midcorrelation between two variables.